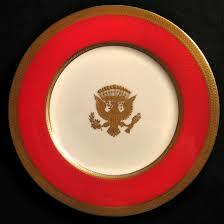 The White House, then and now, requires a huge amount of china place settings. The Reagan Presidential Service is one of the most elegant ever created for the White House. It cost a mega-fortune, but was paid for with private funds. Formal Presidential dinner services have always been needed for formal occasions since the time of George Washington’s terms of office in New York and Philadelphia. It is a mark of sophistication and elegance. It shows the world that the United States can hold its own among nations when it comes to gracious entertaining. Not only are traditional five-piece place settings required, but there are soup plates and bowls, including “handled” cream soup bowls. There are usually oyster plates. Plates for other fish and fowl. Service chargers. Serving bowls and trays. Dessert bowls and plates for any number of dessert types. Even finger bowls. “Every day” settings (still elegant) are used by the President for less formal occasions. Then of course, there is a humungous need for cups, saucers and cake plates for afternoon luncheons, teas and receptions. The White House regularly replaces them by the gross – if not more. Today, the needs of a large White House staff, with its own need to feed and entertain, requires china services befitting the hosts and guest list. Despite all precaution, breakage occurs. So does “souvenir” hunting. In 1879, First Lady Lucy Hayes found need to replace the Grant china service with one of her own. 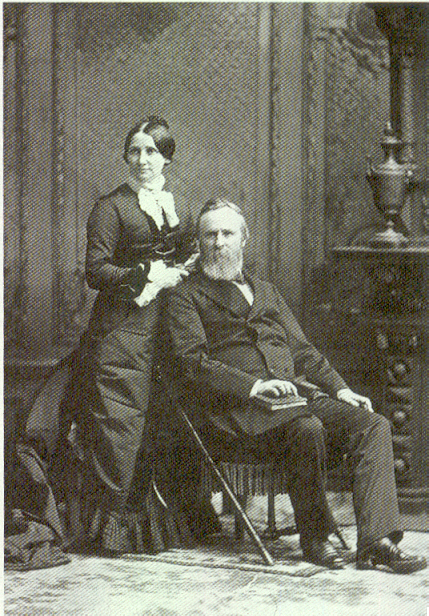 President and Mrs. Rutherford B. Hayes, a pleasant and morally upright couple. Her tenure in the Presidential mansion had been one of mixed reviews: she was nice looking, charming, educated and morally upright. She was also firmly committed to “temperance” and no alcoholic beverages would be served in the Hayes White House, earning her jeers from the less morally upright personages of Washington. Nevertheless, a new set of formal tableware was needed, and she decided to break all tradition with her choices. 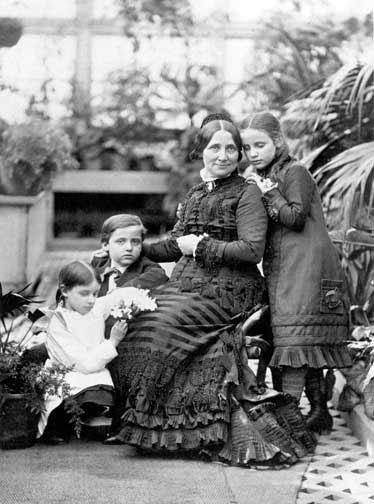 Lucy Hayes and her children in the White House conservatory. It was one of her favorite places, and the inspiration for her unique dinner service. Lucy’s inspiration was to have the dessert service depict some of the ferns and flowers that were planted along the promenade to the conservatory – a “must see” tour following a White House dinner. Several manufacturers submitted estimates for the project, and Haviland & Co. of Paris and New York won the bid – for $2996.50, later revised to $3120. The First Lady was fascinated. She immediately decided that while Haviland would manufacture the china, the design and supervision would fall to Davis. Davis was thrilled. It gave him a chance to be a creative artist as well as an illustrator. Harper’s Weekly was delighted, too. They donated Davis’ time to the project. The idea of the service was to depict the flora and fauna of America the beautiful and bountiful. Dinner plates would be adorned with game animals, usually served at the most formal of banquets: deer in a forest, wild geese in flight, and even a buffalo falling prey to wolves. Fish plates, obviously depicted with shad, lobster, trout and even bullfrogs, would be for seafood. 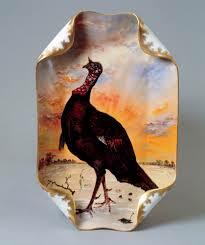 Plates featuring pheasant and quail would be used for game poultry. Soup bowls would be decorated with tomatoes, beans, buckwheat and corn. Fruit plates with apples, berries, pecans and persimmons. And the most original – ice cream plates – decorated with a snowshoe. 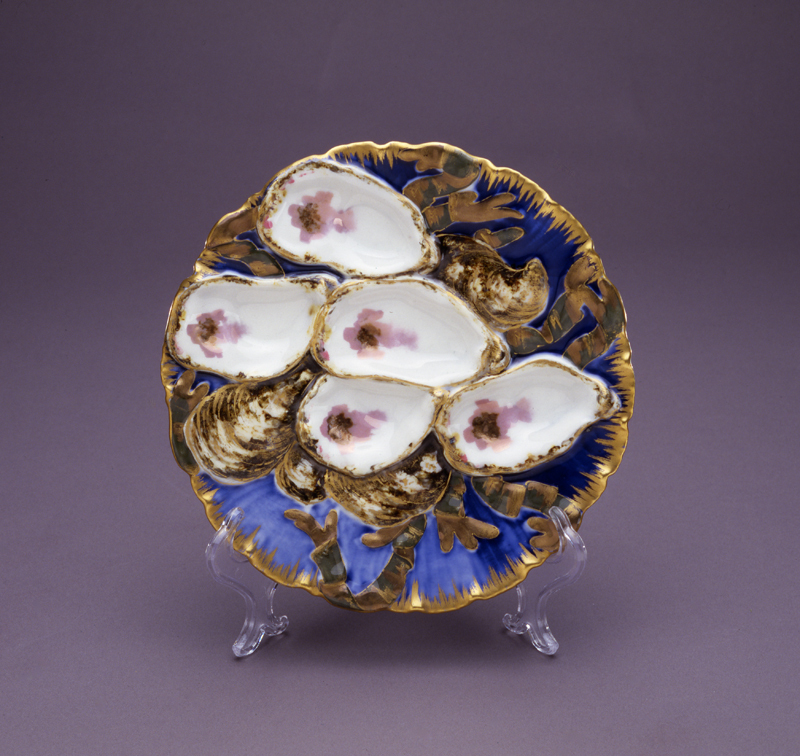 The artistic oyster plates were among the most copied designs. A serving platter from the Hayes Presidential service, with its uniquely upturned edges. Even more unusual and avant garde for the time, was the shape of the plates and bowls and trays. Rather than the customary round plates and oval or rectangular trays, the shapes were oddly fashioned, with upturned and under-curled edges and asymmetrically sculpted trims, all decorated in gold. All in all, there were 592 pieces made, with 130 different decorations – suitable for a nine-course dinner. They were works of art, and so unique, that Haviland produced an 88-page catalog describing the china in detail. When the service was finally delivered in 1880, Haviland-hallmarked and signed by Davis, the Hayes’ used it at banquets honoring President-elect James Garfield, and later at a dinner honoring General and Mrs. Ulysses S. Grant who had recently returned from a round-the-world trip. The Hayes china service astonished the public, who, for the most part were accustomed to the traditional designs favored by more sophisticated Europeans. Some people thought it was magnificent; other believed it to be gaudy. Art critics were, well, critical. The service was seldom used by other Presidents. Many pieces today are in museums. 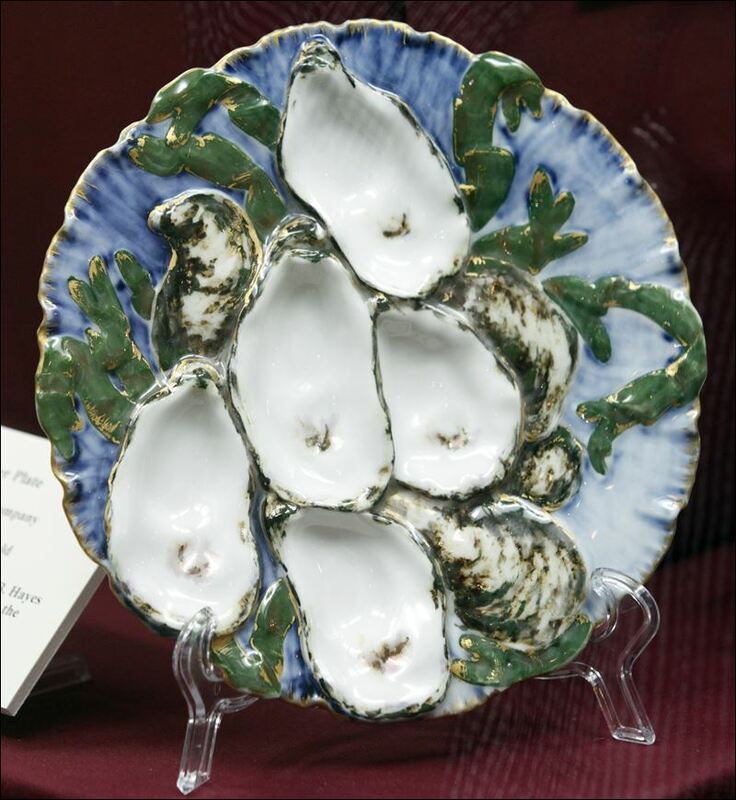 Reproductions of the oyster plates were among those allowed to be retailed in only the finest shops. But it was (as might be expected) such an expensive service for the time, that the Haviland manufacturers found that they were producing it at a great financial loss. It was determined then, with artist Davis’ (and presumably the Hayes’) approval, that a limited number of modified sets of specific plates would be produced for public consumption, and retailed in only the finest department and jewelry stores in America. Those pieces bear a different hallmark on the reverse side, and are not signed by the artist. It is said that Galt’s Jewelers, Washington’s leading jewelry store, was one of the retailers who were permitted to sell reproductions of the Hayes’ service. They had been one of the oldest mercantile establishments in Washington. Thomas Jefferson had been a customer. Mrs. Lincoln had been a customer. And thirty-five years after Mrs. Hayes purchased her dishes, the widow of Norman Galt, once owner of that prestigious landmark, became Mrs. Woodrow Wilson. This entry was posted in A POTUS-FLOTUS Blog, Rutherford Hayes and tagged American history, Feather Schwartz Foster, First Ladies, First Lady History, First Lady Lucy Hayes, Galt Jewelers, General Ulysses S. Grant, Harper's Weekly Magazine, Haviland & Company, history, Illustrator Theodore Davis, Lucy Hayes, Lucy Hayes White House china, Mary Lincoln, Mrs. Woodrow Wilson, Norman Galt, President Hayes, President James Garfield, President Rutherford B. Hayes, President Ulysses S. Grant, Presidential history, Rutherford B. Hayes, The Reagan Dinner Service, Theodore Russell Davis, Thomas Jefferson, White House dinner services, White House Historical Association, White House history, William Seale. Bookmark the permalink. Mrs. Present is reading “The First Ladies” as I type. Loves it!